I have to tell you how clever the Telegraph’s webmasters and servers are. 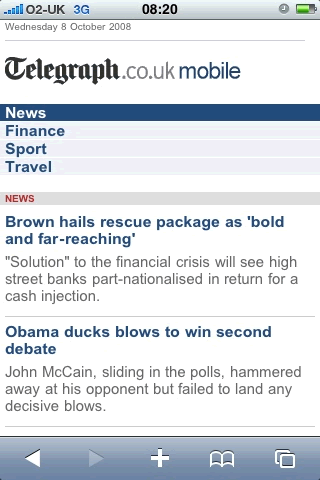 I read the Telegraph’s mobile site on my mobile phone each morning and each evening while I commute. While it’s incredibly brief and concise, and only has a few stories on its front page, it’s better than The Times’ mobile site because The Times makes you click through six pages for each story! Yawn! I go to http://telegraph.co.uk/mobile/ – you should check it out if you’re on the trains. So I wanted to tell you how clever the Telegraph’s webmasters are. Instead of creating separate content for their mobile site, they’ve done the ideal, and they use the very same content as on their normal website. I like this URL (web address) because it’s ‘human readable’ and clearly shows the directory structure of their websites – you can tell this news story is a political and economic one just from scanning the URL. This article was tagged mobile.